This Pork Loin Roast recipe is the perfect holiday main dish! 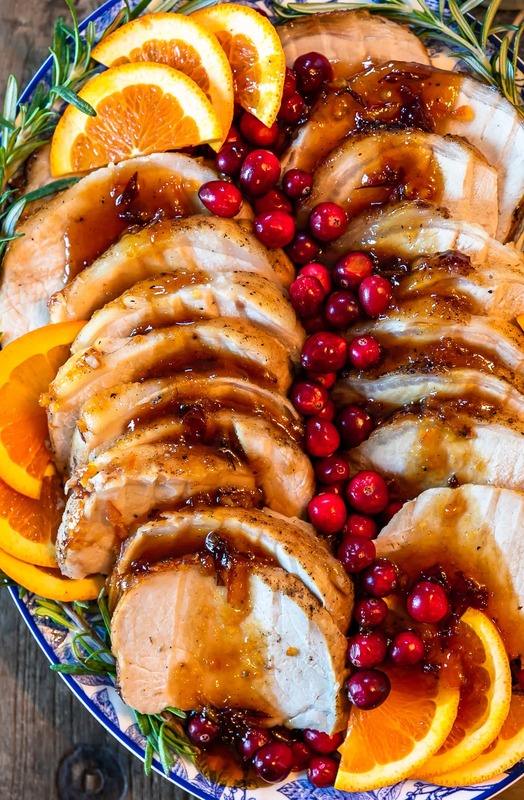 This Orange Cranberry Pork Loin Roast is juicy, delicious, and super festive. Add this roasted pork recipe to your Thanksgiving and Christmas tables! This pork loin roast recipe is perfect for the holidays. Make this Orange Cranberry Roasted Pork for Thanksgiving, Christmas, or any special meal this season! Still working on your holiday menu? Thanksgiving is almost here, but if you’re like me, the details aren’t 100% nailed down just yet…but don’t worry! If you’ve left the Thanksgiving meal planning to the last minute, today’s recipe is going to be your saving grace. Especially if you’re not a fan of turkey! That’s right, you can have a turkey-free Thanksgiving and still get all the flavors of the holiday. 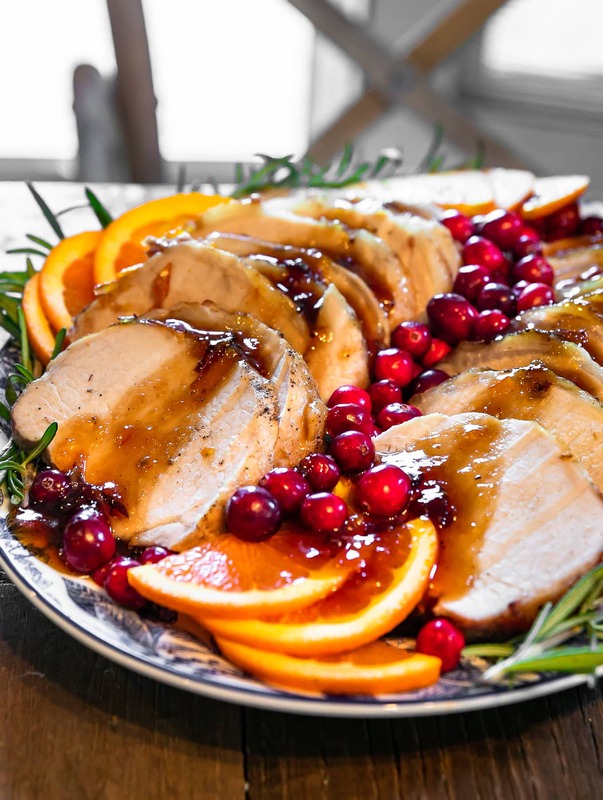 This Orange Cranberry Pork Loin Roast recipe is the most festive option thanks to the orange cranberry glaze. Maybe you don’t like turkey, or maybe you just want to change things up this year. Either way, this delicious roasted pork will fit just perfectly at the center of the holiday table. This is a great Christmas pork tenderloin recipe too, and could even be a fun Easter dinner idea! 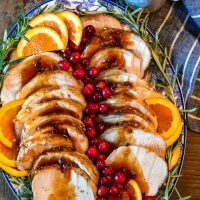 So if you want to stick to the classic turkey for Thanksgiving, you still have a chance to make this amazing cranberry pork loin recipe this season. 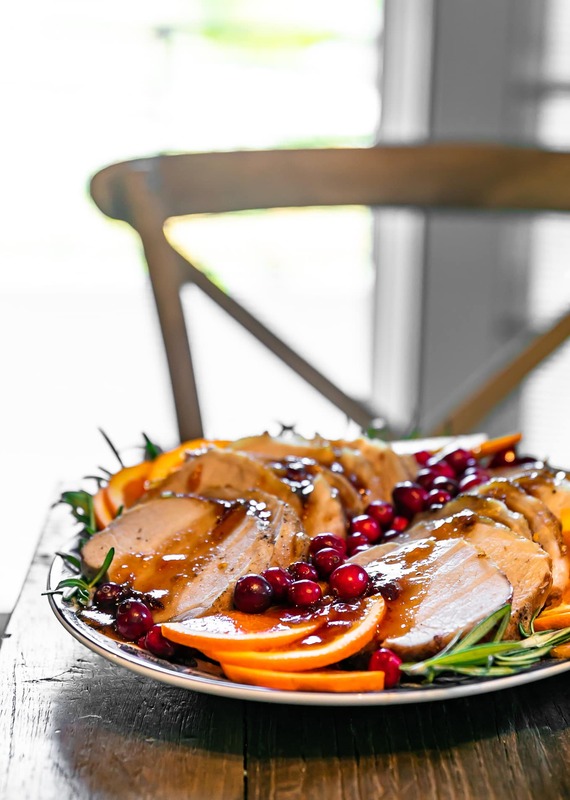 Skip the turkey this year and make this amazing Orange Cranberry Pork Loin Roast recipe instead. It’s so flavorful and just as festive! 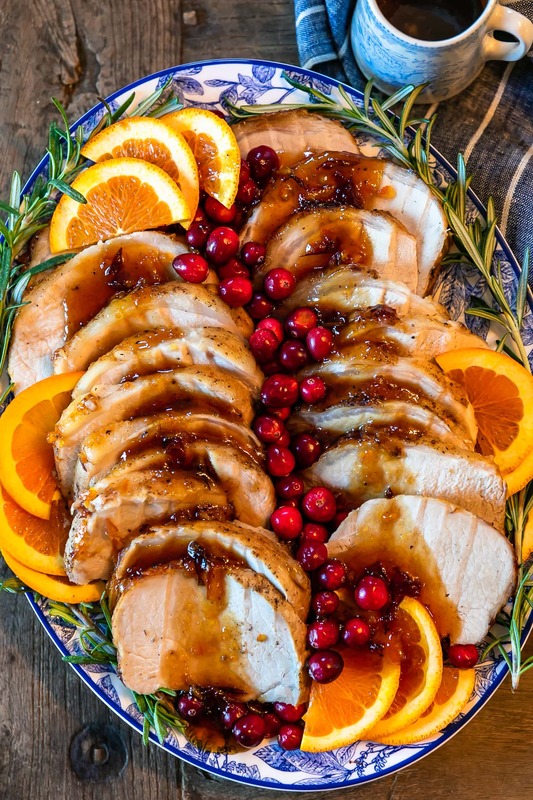 The orange cranberry sauce is what makes this pork loin roast recipe so amazing! It adds such a bright and cheery flavor, which is why it’s so perfect for the holidays. I love this roasted pork recipe for Christmas, so that I don’t have to make the same turkey dinner all over again a month after Thanksgiving. It’s just as festive, but it adds something new and delicious to the table. And if you don’t want to completely replace the turkey, consider making this as a second main dish option. A lot of people make a turkey and a ham every year, but you could use this is your holiday pork option instead. Trust me, you’re going to want to try this! What can you make for Thanksgiving besides turkey? I know turkey is synonymous with Thanksgiving, and I do love a classic turkey dinner. BUT, you don’t have to make turkey if you don’t want to. 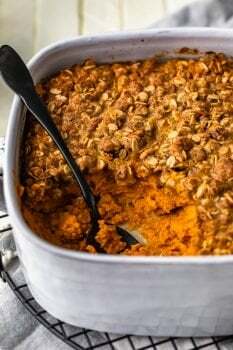 A lot of people just don’t like it, but they still serve it at the center of their Thanksgiving meal every year. Don’t be afraid to break tradition to make something more fitting for you and your family. And even if you do like turkey, it’s nice to change things up every once in a while. So if that’s how you’re feeling this year, try out this Orange Cranberry Pork Loin Roast recipe for the holidays. You’ve got the cranberry flavor that perfectly complements the rest of the meal, and this roasted pork is SUPER juicy and delicious. It will look so beautiful on the table, surrounded by the rest of the food. Maybe it’s time to replace Thanksgiving turkey with Thanksgiving pork…or at least just this once. Roasted pork is such a great main course option this time of year. It’s so incredibly juicy and flavorful, and it’s easy to make. 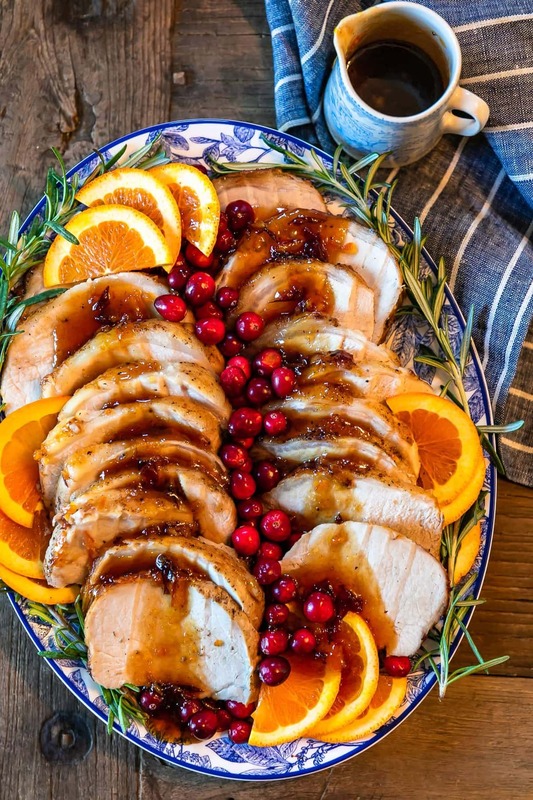 Plus, this Orange Cranberry Pork Loin Roast just looks extra festive and beautiful. It roasts in that orange cranberry sauce and comes out tasting so good! Prep the pork: pat dry, rub it with olive oil, then season it with salt and pepper. Sear the pork loin, about 2 minutes on each side. Make the orange cranberry sauce: combine orange juice, apple cider vinegar, orange marmalade, and cranberry sauce in a bowl. Place the pork loin in a roasting pan and pour the sauce directly over it. Remove the pork loin roast and let it rest/cool. Add remaining juices to a saucepan. Bring the mixture to a boil, then let it simmer while the pork rests. When you’re ready to serve the pork loin roast, slice it up, place it on a serving platter, drizzle the extra sauce over it, and then garnish with fresh cranberries and orange slices. I can’t get over how beautiful this dish looks, and it tastes just as good! What sides go with pork loin? If you need more help getting your holiday menu together, I’ve got you covered. This e-book is filled with 130+ holiday recipes you can make for Thanksgiving and Christmas, and they’re all gathered in one place. Get it right here! 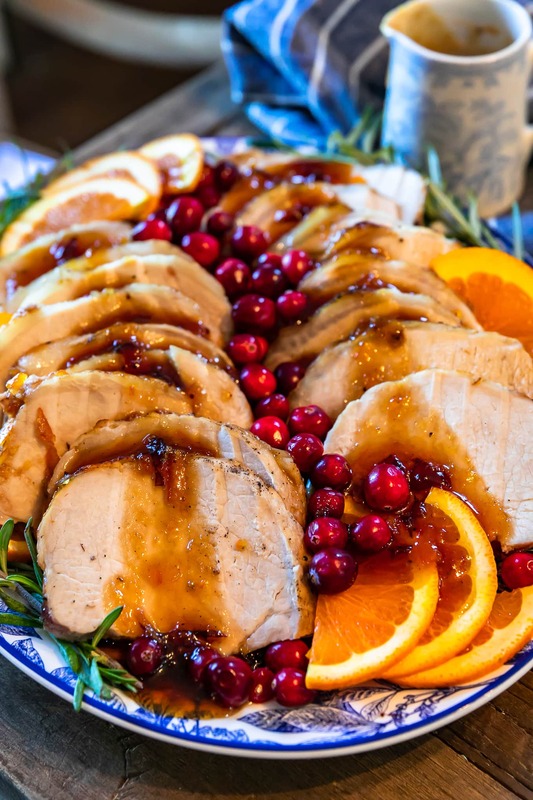 I hope you guys try this amazing Orange Cranberry Pork Loin Roast recipe this year! 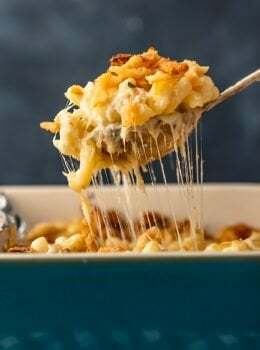 It’s sooooo good and it really is perfect for holiday feasts. Happy holidays! See the recipe card below for details on how to make this Orange Cranberry Pork Loin Roast recipe. Enjoy! Place pork in a shallow roasting pan or grill pan and pat dry with a paper towel. Rub all sides with olive oil. Season with salt and pepper on all sides. Sear each side over high heat for 2 minutes per side, 10 minutes total. While searing, make your sauce. In a medium bowl, stir together the 1/2 cup orange juice, vinegar, marmalade, and cranberry sauce. Place seared pork in a large roasting pan and pour sauce over the pork. Cook for 60-80 minutes or until internal temperature reaching 140-145 in the most central part of the pork. Baste every 20 minutes in orange juice mixture. Remove from oven and place pork on a foil tented plate to cool/rest for 10 minutes. While pork is resting, add remaining 1/4 cup orange juice to the juices left over from cooking. If your roasting pan is stovetop safe you can just keep all the sauces in the pan or if not, add to a saucepan. Bring sauce to a boil and then reduce to a simmer while pork rests. Slice and serve pork, drizzled with more sauce and garnished with orange slices and fresh cranberries. We love pork dinners in our house and this flavor twist sounds delicious! Yum! It’s definitely one of our favorites too! Looks delicious! Perfect for the holidays. This is amazing! We’re definitely doing this next time we have company for the holidays! Yay! Hope you love love it! I absolutely love the orange cranberry combo here! This pork loin is amazing! This looks so good and I love how easy it is to make! I can’t wait to try this recipe! It looks so Christmas with the cranberries. Wohoo, one of the most vivid pork tenderloin dish I ever since 😍 Must be really really delicious! This is a brainy alternative or shall we say an add-on for turkey for every dinner table during Thanksgiving. I think this will work well or even great for every household. It’s so excellent, and I can’t wait to try it cook at home this weekend.